The Sparkle Magic Illuminator Laser Light is a holiday lighting solution that comes with three separate illuminators to set up – green, red, and blue. 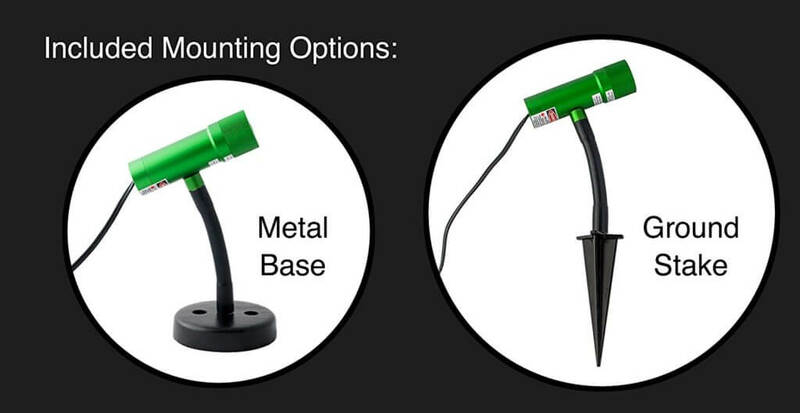 They are weatherproof, easy to install, and can be staked in the ground or set on a weighted stand. The necks of the illumintaors are fully adjustable to hit any target you need. This is a great way to spread some Christmas cheer! The Sparkle Magic Illuminator Laser Light uses less energy than traditional holiday lights, and it’s designed, assembled, tested, and packaged in the USA. They come housed in an aluminum body, and are weather resistant to withstand any climate. 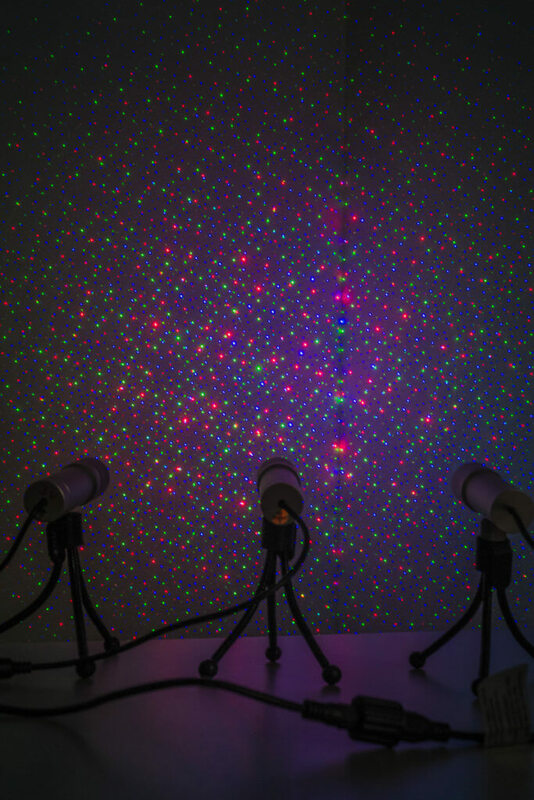 The Sparkle Magic system can install in just minutes, and all 3 illuminators can share a single power cable. The power cable provided extends 15 feet, but you can use an additional extension cable if needed. When installed 35 feet away from your target, it covers an area of 25 feet high by 25 feet wide. Q: How much area does one Illuminator cover, what is the light spread? The coverage is approximately 25 feet by 25 feet. The further you move the Illuminator from your target, the wider spread you will achieve. The spread of light will narrow the closer you move the Illuminator to your target. Q: How is the Illuminator powered? The Illuminator Laser Light comes with a power adapter with cord that plugs into any standard wall outlet. You can run an extension cord to the Illuminator as needed. Q: How much power does the Illuminator draw? How long is the cord? The power consumption is less than 5 watts, much less than a florescent bulb. The cord is 52 inches long. Q: Is the Illuminator weather resistant? Yes, the Illuminator is weather resistant for any climate and suitable for indoor or outdoor use. Q: Does the Illuminator come with a warranty? The Illuminator comes with a 1-Year Limited Warranty. Q: Are there any concerns with possible legal issues with use of the Illuminator, such as laser lights and airplanes or flight paths? Generally speaking, the beams will become negligible after 750 feet. Providing the Illuminator is used properly and as per the instructions, you should be in compliance if you are not within a mile of an airport. Here is a link for the FAA guidelines in case you have any concerns. This holiday laser light system is pricier than other options, and doesn’t include some features like moving patterns, or remote control. You can adjust the pattern of the lights, though. If you’re looking for a still, multi-color holiday light projector solution, we still recommend the Sparkle Magic Illuminator because it is very high quality and brighter than other choices on the market. Check out the video below to see these lights in action! Ready to take your holiday decorating to the next level?